Today we leave the confines of Earth and look at the vast universe; we have photos from two readers, and their notes are indented. Click on photos to enlarge them. 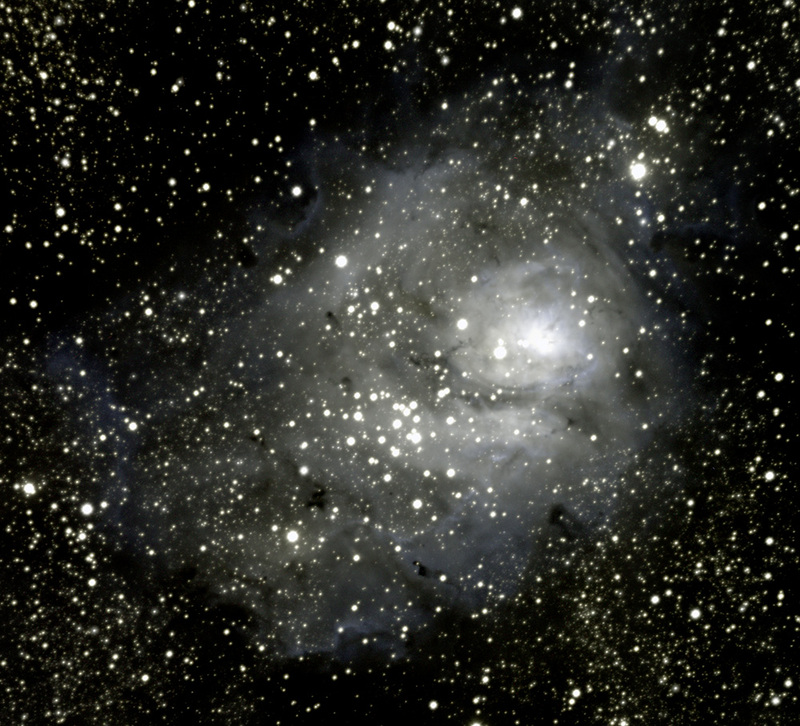 Attached is an astrophotograph of NGC6523, also known as the Lagoon Nebula. It is a composite of fifteen 240-second exposures taken with a 127mm refracting telescope and a colour astronomical camera. I have been practicing my widefield astrophotography skills this summer (preparing for a trip to Namibia in September to do even more of this kind of stuff… and I’ll be sure to send you those pictures after I return). All of these pictures were taken from a Rattlesnake Lake, WA, near North Bend, where Rattlesnake Ridge hides most of the light pollution from the Seattle area. All used a Canon EOS 6D, mounted on a StarAdventurer tracking mount. 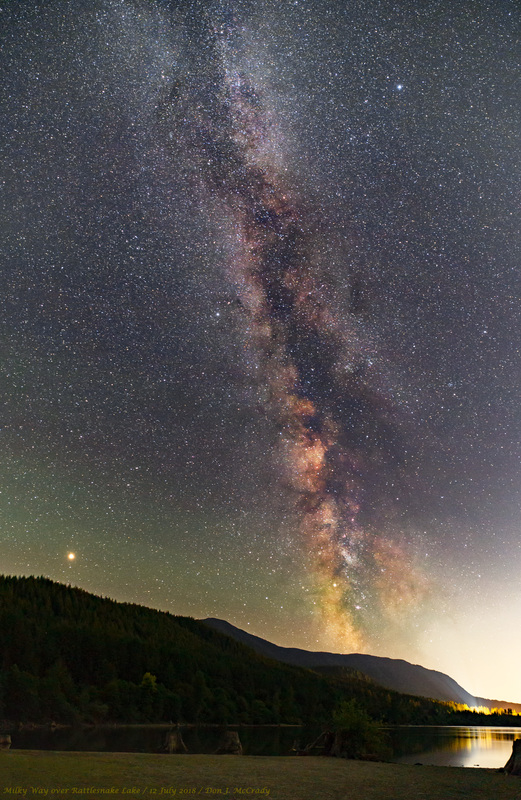 First, a nearly vertical Milky Way rises over Rattlesnake Lake. This is a single shot taken with a Rokinon 14mm SP f/2.4, at ISO 4000 for 40 seconds. I used the StarAdventurer at 1/2 sidereal rate to minimize star trailing while maximizing the exposure. The extremely bright “star” on the lower left is Mars. The bright lights drowning out the core of the Milky Way are from the watershed education center. For the following shots I switched to a 200mm lens to zoom in some of the more interesting portions of the Milky Way. This yields a 12 degree angle of view. These were also tracked at the full sidereal rate for approximately 30 minutes of total exposure. 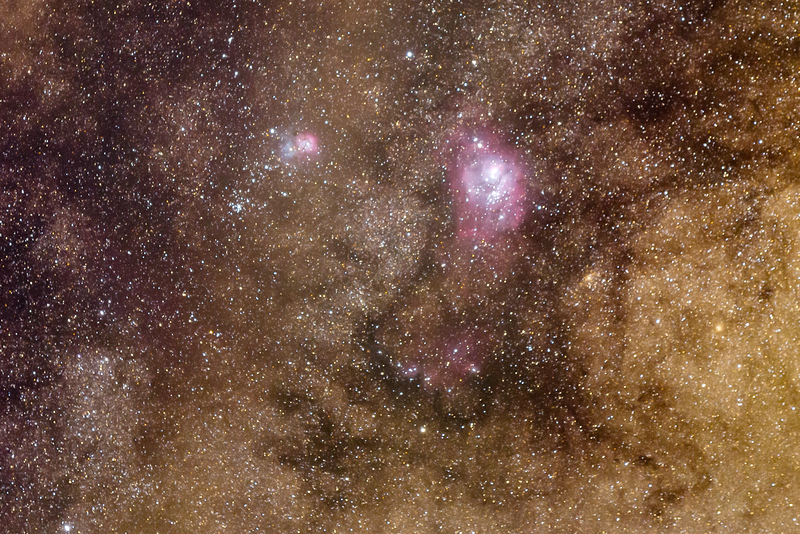 This field of view in Sagittarius contains three Messier objects (M8 – the Lagoon Nebula, M21 – the Trifid Nebula, and the open cluster M21) as well as several smaller objects such as the tiny globular cluster NGC 6544. The camera was mounted on a Star Adventurer tracking head, using 2 minute exposures. I took this from Rattlesnake Lake, WA, just before the clouds started rolling in. 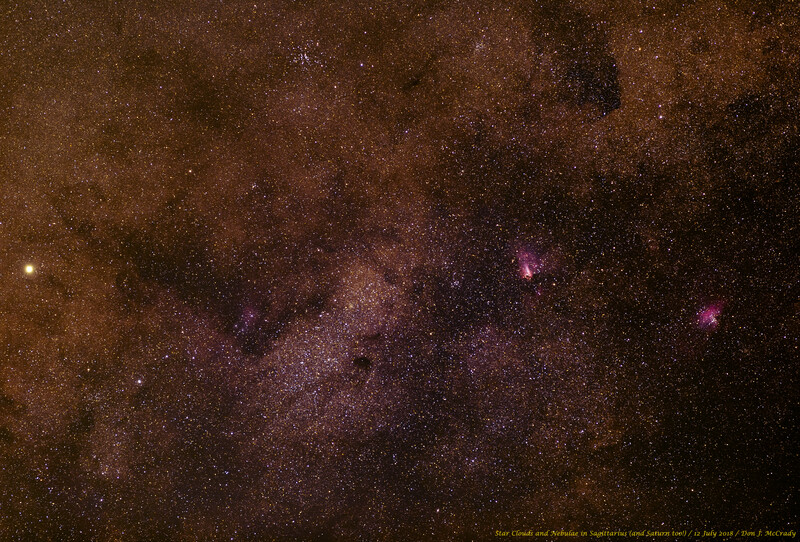 Moving slightly north but still in Sagittarius, this view features most prominently the M24 Sagittarius star cloud near the center, flanked on the right by two very bright nebula: M17 (the Omega nebula) and then M16 (the Eagle nebula). Near the top are two smaller open clusters, M25 and NGC 6647. As a bonus, on the very left of the frame is the planet Saturn. 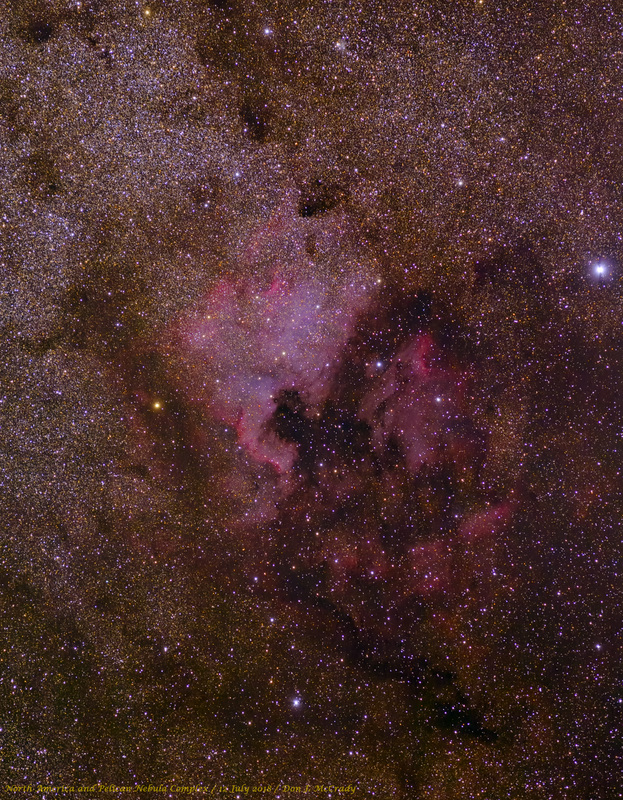 Finally, much farther north in the constellation of Cygnus is this widefield view of the North America Nebula (NGC7000) and its slightly dimmer neighbour the Pelican Nebula (IC 5070). This entry was written by whyevolutionistrue and posted on July 21, 2018 at 7:45 am and filed under astronomy, photography. Bookmark the permalink. Follow any comments here with the RSS feed for this post. Both comments and trackbacks are currently closed. Lovely! I especially like the last picture. AMAZING! Excellent work! Keep it up! Gorgeous pics both of you! Thank you! I imagine there’s some wildlife somewhere in these shots. Spot the alien! Tim. Why is your pic apparently monochrome? Impressive! Particularly the top two. Thanks for these terrific photos; they are intensely moving and magnificent for someone who has lived all his life in towns and cloudy cities with light and other forms of pollution, and only the occasional use of some not very good binoculars. That last pic reminded me of the cover of King Crimson’s “Islands”. I de-saturated the colours to focus attention on the nebular structure. Breathtaking pictures like these have once inspired me to make up a story. It is a short one but too long to post it here. I will gladly email or whatsapp that tiny Word file to anybody who states his addrees here, or to my email: federico1931atyahoo.com.ar. How can you not love science (astronomy) when you see so much beauty in the Universe? Why we have to fool ourselves with other stuff when there is … science? What do you need more then this?